I had a stopover in the Omani capital of Muscat last week, a place where I worked for a few years in the late 1970s / early 80s. The capital area has grown enormously since I was there and is today built up all the way from Seeb Airport to old Muscat town, a distance of around 35 km. In this blog post I am showing a few photos of the historic Muscat harbour area to show how it has changed over the years. Muscat in 1904. This old photo shows the city walls and gates which were locked at 6 pm every evening and anybody venturing out after dark had to carry a lantern. Sultan Said bin Taimur, father of the current Sultan. Under his reign, Oman was a feudal, backward and divided country. There were almost no roads, schools or hospitals. Citizens had to obtain the permission of the Sultan to buy a radio or to wear spectacles. He was overthrown by Sultan Qaboos in 1970. By the early 1970s the town looked much the same. The rugged mountains surrounding Muscat are made from ophiolite, a rock formed from magma under the oceanic crust and uplifted and exposed above sea level. Oman’s outcrops are considered as some of the best examples of this type of landscape. Bait Bait Greiza (above centre) was built in the early 19th century and demolished in the 1970s. The name Greiza originated from ‘igreja’ (Portuguese for church) as a church once stood nearby. 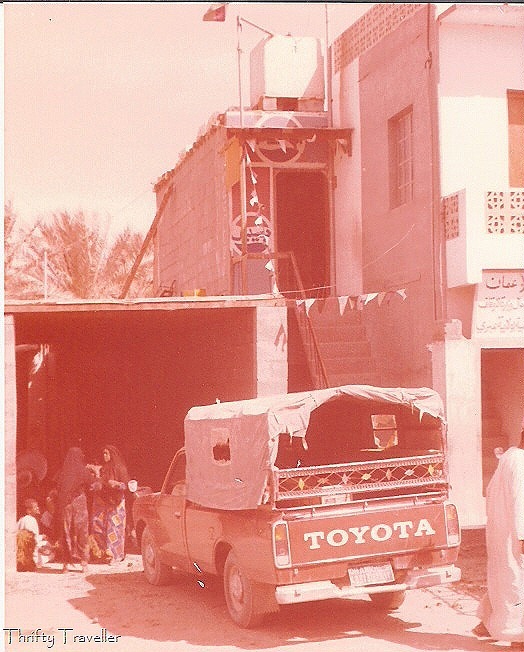 Bait Mughub served as the American Embassy until 198o, following which is was demolished, along with the nearby British Embassy, to make way for a new wing of the Sultan’s palace complex. Bait Faransa was built between 1820-1840. It became the French Consulate in 1896. Jean Béguin-Billecocq, Vice Consul, pictured in 1904 feeding his parrots on the terrace of the Consulate in Muscat, probably wishing he had studied Vietnamese instead of Arabic at l’École des Langues Orientales de Paris. At least he had his wife Louise for company. Louise Béguin-Billecocq at Sur (Oman). Oddly she appears to be wearing a Japanese kimono but perhaps she found the silky material and full length cut to be more appropriate for local climate and cultural conditions than typical western attire of the period. Al Khor Mosque is one of the oldest in Muscat although it has been renovated a number of times. It is overlooked by Al Mirani Fort. Al Mirani Fort is one of the twin forts guarding the entrance to Muscat harbour. Both forts were built by the invading Portuguese who bombarded and burnt Muscat around 1507 AD. The tower on the right is a more recent addition and conceals a lift shaft. Unfortunately neither fort is open to the public. Al Jalali Fort is the other fort guarding the harbour. It served as the country’s main prison up until the 1970s and jalali was the generic term for prison during my time in Oman. 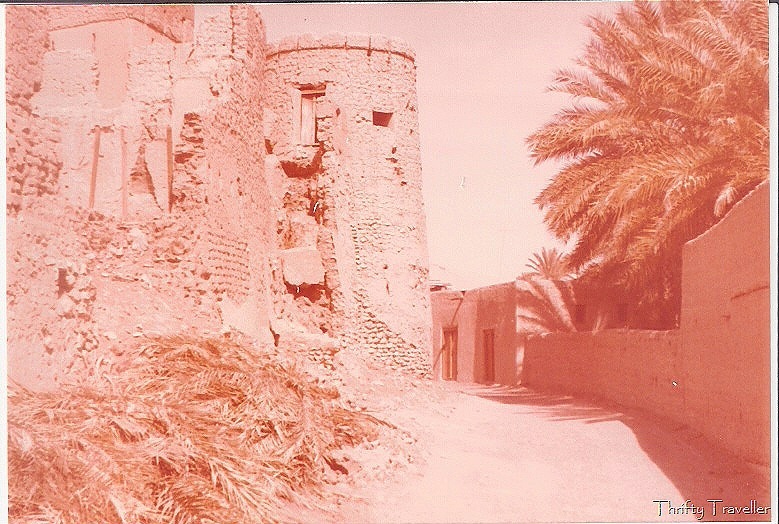 Left to Right: Al Jalali Fort, Extension to the Royal Court, the 1970’s Al Alam Palace. A semicircular lawn has been added in front of the palace on reclaimed land. A couple of modern naval guns are mounted on the sea wall to provide additional protection against sea-borne attackers. This is the same harbour front in the 19th century. The British Embassy (where my parents lived and worked in the 1980s) was on the left. The taller building sticking up behind the British Embassy was the American Embassy. The Al-Zawawi Mosque, built inside the city walls at the beginning of the 20th century, is unusual for its square tower minaret, said to be built in the Portuguese style in favour in India at the time, and looking rather church-like. Facing the Al Alam Palace a red-paved mall has been constructed, perhaps imitating the one in front of Buckingham Palace, flanked by gardens and stately colonnades and leading up to the impressive National Museum of Oman. You could cash a cheque here if you had a few hours to spare. 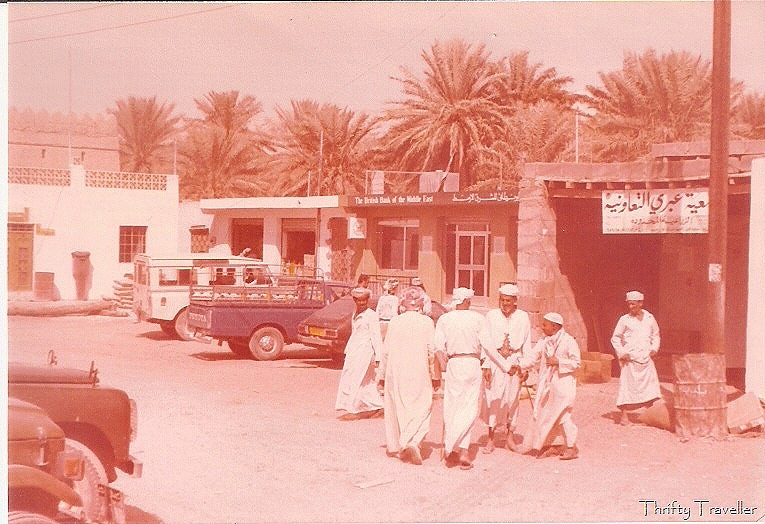 This is how The British Bank of the Middle East, Muscat looked in the 1970s when I worked there. The building was completed in 1956. 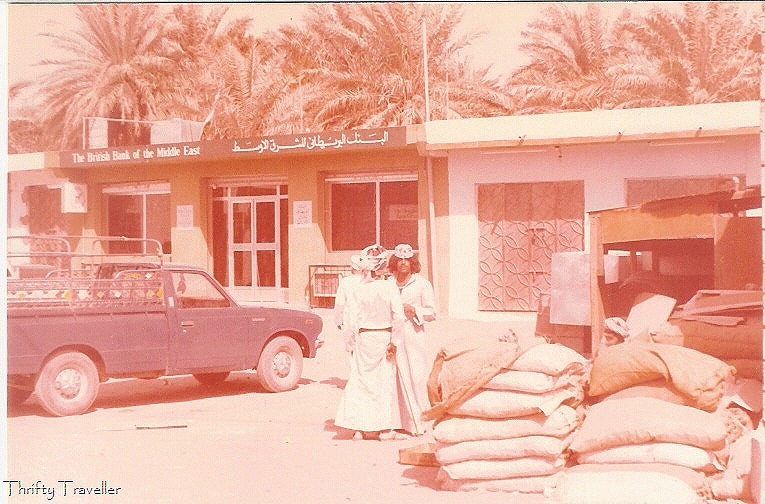 Prior to that the bank had operated from premises in Bait Faransa. The bank is now demolished. One of our competitors at the time. 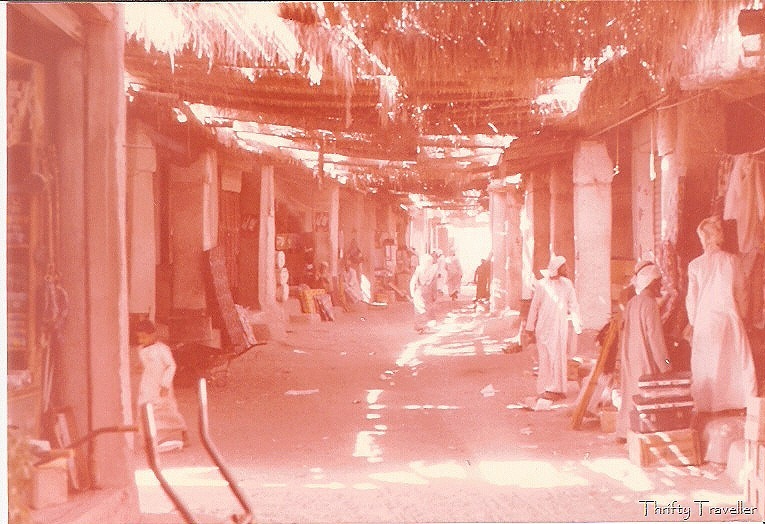 Thanks to Muscat Gate Museum where most of these old photos were obtained. A country that I have not yet written about on this blog is Oman. I lived there for just over four years from November 1976 to February 1981 when I was a very young man working for The British Bank of the Middle East (now HSBC Bank Middle East). I have very few photos remaining from this period of my life and those that do survive have faded to a nasty brownish monotone as you can see. 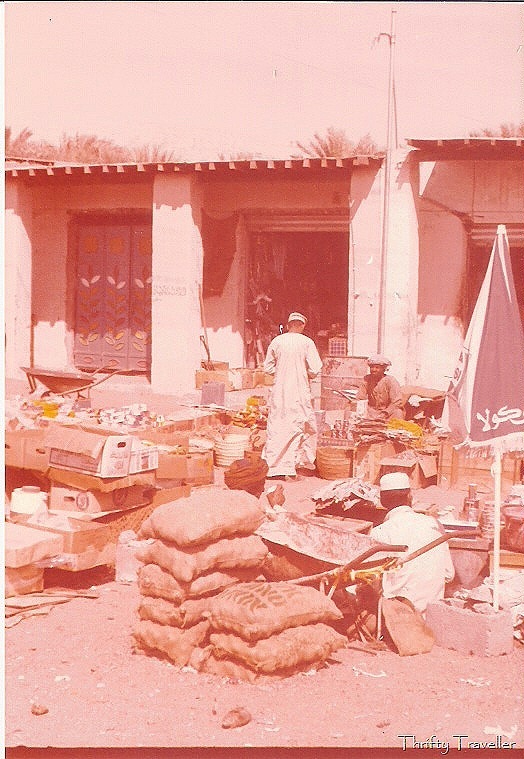 In 1979 I was working as a leave relief officer and was sent to numerous branches all over Oman to enable the branch managers to attend training courses or take ‘local leave’. One such assignment was to Ibri, a small oasis town in the back of beyond, several hours drive from the capital, Muscat. With hindsight you have to wonder why the Bank ever opened a branch in Ibri. There was very little commercial activity other than small traders and builders. The interior of Oman was fairly impoverished in those days and most of the personal savings and current accounts had very low balances. Over half of the customers were illiterate and transactions were evidenced by thumbprints and account holders were identified by the photo stapled in their savings passbook. The staff too had very little schooling. Apart from the bank manager there were only two westerners in the town – they worked for the US Peace Corps and were married to each other. For entertainment. the manager would occasionally drive 100km (round journey) to the Strabag camp near Bahla to watch a film and have a beer (Strabag, an Austrian/German construction company, were building a road nearby). Restaurant (with the ‘Bebsi Cola’ logo). My favourite mid morning snack was an omelette, flavoured with thin slices of fiery green chillies and rolled up in Arabic bread. It was delicious. 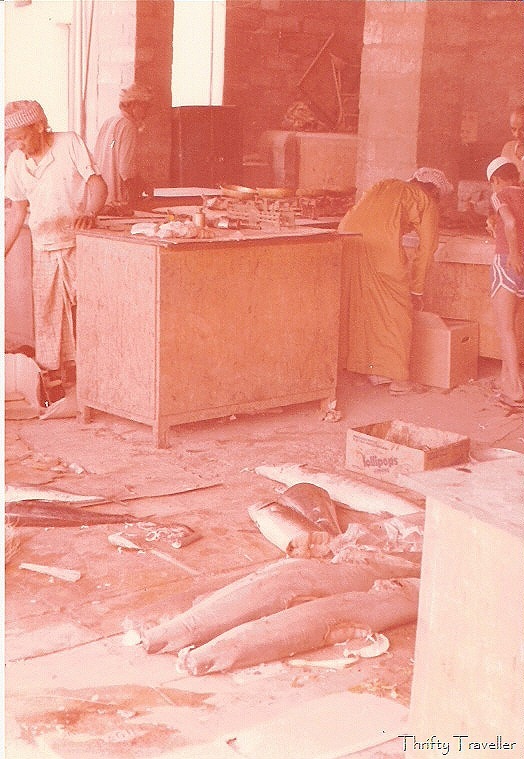 Ibri Fish Souq in 1979. Sharks with fins removed? Considering Ibri was so far from the sea, its fish market had quite an array of fish but with no fridges or ice in sight it didn’t smell great! Bank Land Rover (white) in front of the branch and, if I’m not mistaken, my old Toyota Corona hatchback next to the pick-up. Shaking hands was (and probably still is) the main social pastime in Ibri. I would have to shake hands with each of my staff and say Kaif Halak? (how are you?) several times a day. Needless to say, after 4 years in Oman I was completely barmy! 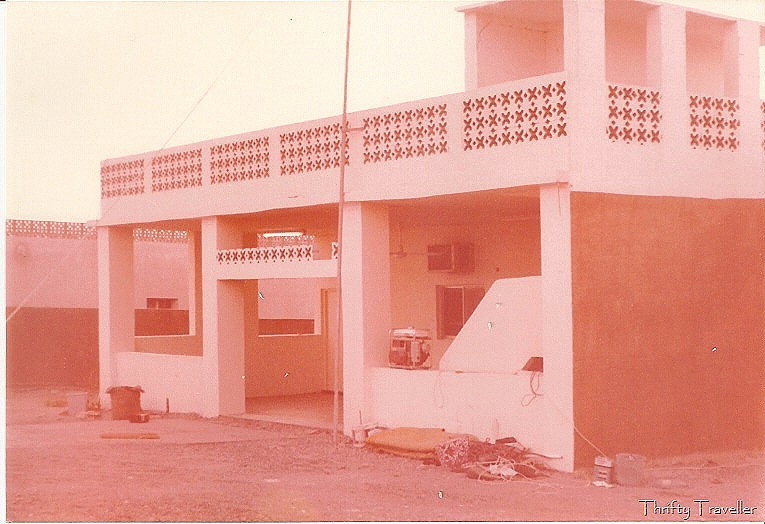 The Bank Manager’s Residence in Ibri, 1979. Note the generator on the porch. After a hard day in the office helping his staff to look for the cash shortage and balance the general ledger the bank manager returned to this palatial home for a stiff gin and tonic, an inedible meal and a lonely evening-in listening to Abba cassettes before the power went out. I was only there for a few weeks but we all felt sorry for the poor guy who was the regular manager. Ibri was not an easy assignment for a young bachelor and the Bank recognised this by rotating the manager out and back to civilisation (i.e. Muscat) after less than a year. Ibri, Nizwa, Buraimi or Bahla? I can’t remember. My memory is as faded as the photo.